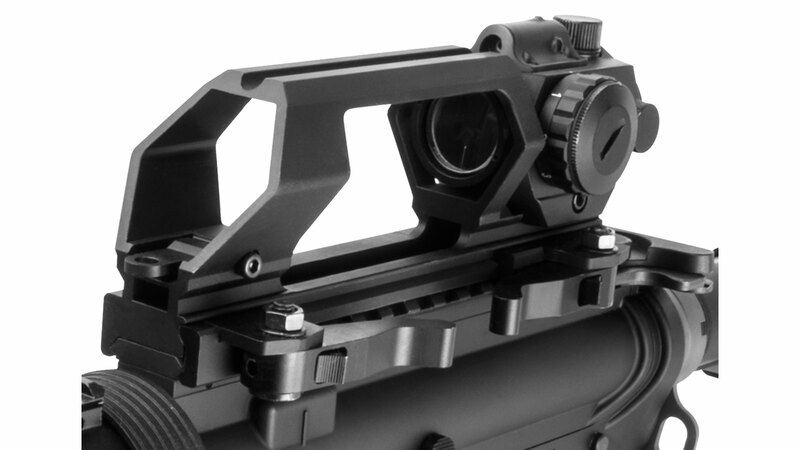 - With the VDGRLB there is a Laser Channel machined onto the Top of the Carry Handle. - In the front is an adjustable for windage Back-Up Flip-Up Rear Aperture Iron Sight set at the proper 1" AR15 sight height. - Green Dot Reflex Optic with integrated Red Laser is two sighting devices in a compact and sleek design. - Green Dot reticle is fully adjustable for Elevation & Windage. - Integrated Red Laser is fully adjustable for Elevation & Windage, independent from the Green Dot. - The Green Dot and Red Laser is controlled by a single Rheostat Dial.